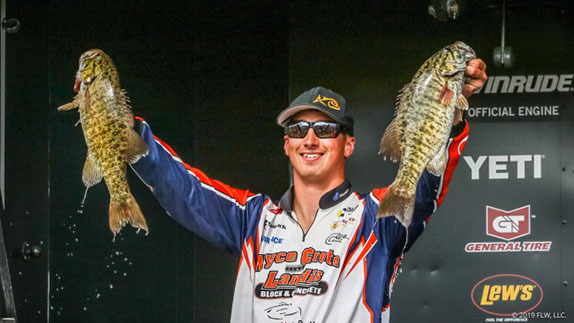 Brent Butler relied on a variety of reaction baits over three days at Lake Chickamauga. For Brent Butler, Sunday was all about playing catch-up. He graded 100 or so papers turned in by the Sequoyah High School students in his Fundamentals of Construction and levels 1 and 2 Carpentry classes. He also mixed in a trip to a big box home improvement store. He was pretty well occupied during the first part of the weekend as he put the finishing touches on a victory at the Lake Chickamauga Southeastern FLW Series. He sandwiched 14 1/2- and 16-plus pound bags around a massive 37-05 stringer to pull off a 40th-to-1st comeback and capture the first triple-A level victory of his career, holding off the fearsome Bryan Thrift in the process. 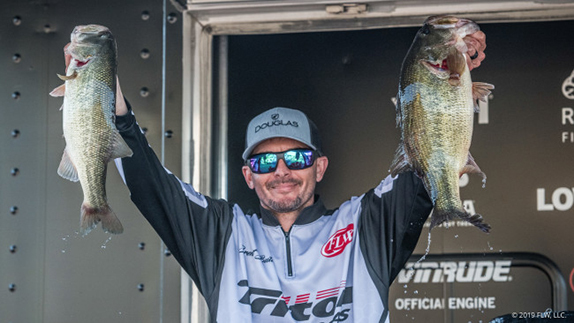 Despite a slower-than-expected day 1, Butler worked his way back into contention with an unforgettable day 2 that ranks among the best ever in the FLW Series. His 37-05 is the fifth-heaviest bag in the series� history and it�s the biggest bag caught in the series that didn�t come from Falcon Lake. He relied on an array of baits through the event, including an umbrella rig, and sealed the victory with a late-afternoon 6-pounder on day 3 to beat Thrift by 5 1/2 pounds. A carpenter by trade who now teaches Building Trades and coaches the fishing team at Sequoyah H.S. in Madisonville, Tenn., Butler has an extensive background at Chickamauga. 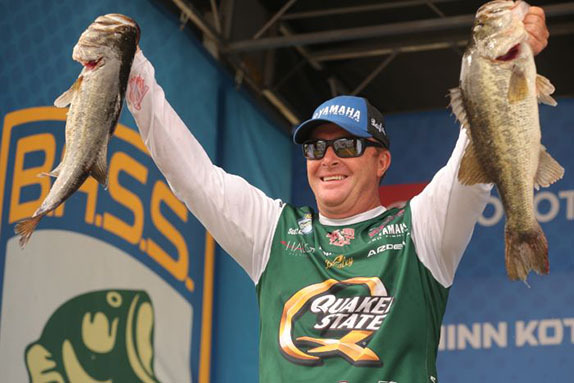 He began fishing there in the late 1990s and won the Tennessee State Federation championship there in 2006. Count Butler among the anglers to be betrayed by a good practice. He spent a few hours in the evening on the lake last Monday and Tuesday and got a full day on the water Wednesday. He entered the event confident a stringer in the low 20-pound range was attainable each day. He noted the fish to be in all phases of the spawn even with water temperatures in the low to mid 50s and in the wake of tremendous water flow through the Tennessee River system due to heavy rains in recent weeks. He came out of practice with a shallow-water mindset and he felt committed to the upper end of the lake. On day 1 of the tournament, he relied on lipless and square-bill crankbaits in shallow water, but all he caught were smaller male bass. He caught 60 fish by his estimation, but none bigger than 3 1/2 pounds. He tallied 14-08 and was 40th after day 1. Butler tried to implement adjustments late on day 1, but he admitted they weren�t the right ones and he was in the wrong part of the lake to make them. The following day, however, everything he did came up roses. He shifted his attention to the mid-lake area and threw an umbrella rig from the get-go. Two 3-pounders and a 7-pounder right away laid a strong foundation as he tried to avoid the crowds of anglers beating the banks. �I knew they were aggressive and feeding,� he said, noting the current flow was roughly half of what it had been, but still twice the normal range for this time of year. 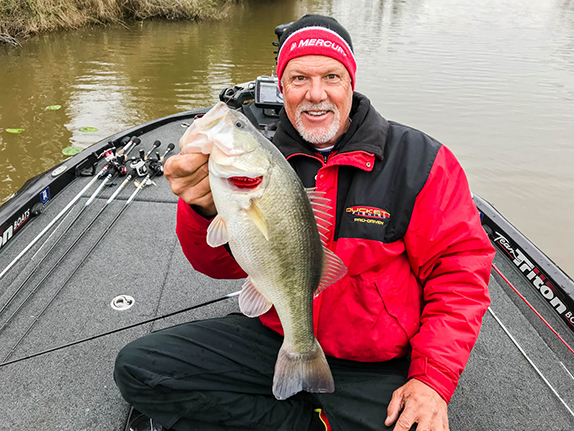 After a dry spell that saw him bounce around to a dozen different spots, he began looking for similar areas that might be holding gizzard shad. With the clock nearing 11 a.m., he stopped on a deep river ledge and noticed bait suspending on the ledge. He could also detect a few fish within the bait on his electronics. He backed off into the river channel and began casting toward the bait. He quickly landed another 7-pounder and finished his limit with a 5-pounder. After the action slowed again, he made a 15-mile run back to mid-lake to a spot where the bait were set up the same way. A few casts later, he hooked an 11-10, which took big-bass honors for the event. At that point, his smallest fish was a 6-pounder. Amazingly, the kicker was not a personal best. He caught a 12-07 in a charity tournament at Chickamauga several years ago. After 12 bags of 20 pounds or more were weighed in on day 1, just three crossed the scales on Saturday, but Butler�s 37-05 dwarfed them all and gave him a lead of 5-06 entering day 3. Entering the final day, Butler knew more adjustments would be in store. �I knew that the fish were changing for sure and other guys were on fish and I knew the areas they were fishing,� he said. He consciously steered clear of those areas for two reasons, he said. His morning was nearly a total loss. At 12:30, he one 3-pounder in the livewell. The umbrella-rig bite wasn�t what it was the previous day as the baitfish had repositioned into the river channel. He managed to get five keepers, but none were bigger than 3 pounds, with a lipless crank and a jerkbait producing the majority of bites. By mid-afternoon, he was in all-out scramble mode trying to hit that 17-pound target. With less than 20 minutes to fish, he was running up the river when he ran past a spot that he�s fished in the past. The fish didn�t push him past the 17-pound mark, but it gave him 16-11, which was enough to hold off Thrift, who caught 23-13 and 22-15 over the final two days, respectively. He said with the barometric pressure rising, the jerkbait and single swimbait became more of a factor. Both accounted for fish he hauled to the scale on Saturday. A lipless crank caught the other two. He said the decision to go to a single swimbait was a product of a hunch he had about how the lake was reacting to the amount of fishing pressure. �These fish think like humans,� he said. �We see so many M&M�s, but we can only eat so many. Then they see a PayDay bar and say, �Ooh, I�ll take that.�"
> Umbrella rig gear: 8� medium-heavy Douglas Outdoors LRS casting rod, Shimano Curado (out-of-production model) casting reel (6.3:1 ratio), 60-pound Sunline FX2 braided line, Super G Lures 5-arm/4-blade umbrella rig, 1/8-oz. homemade swimbait jig heads, 4.3� Keitech Swing Impact FAT swimbaits (pro blue red pearl), 4� Zoom Swimmin Super Fluke Jr. (albino). > Butler used the Keitech baits on the jig heads and the Zoom Flukes on the two dummy (hookless) wires. > He wasn�t picky on where he threw the umbrella rig, using it in both shallow-water and offshore scenarios. > Lipless crankbait gear: 7�1� medium-heavy Douglas Outdoors LRS casting rod, Shimano Curado (silver) casting reel (6.3:1 ratio), 15-pound Seaguar Red Label fluorocarbon line, 1/2-oz. Strike King Red Eye Shad (chrome). > Butler says the bait he had tied on has very little of its original paint left on it. He has three others just like it but could not generate bites with them like he could with the well-worn model. > Jerkbait (shallow) gear: 7� medium-action Douglas Outdoors LRS spinning rod, Abu Garcia spinning reel, 8-pound Seaguar Red Label Fluorocarbon line, Lucky Craft Pointer Minnow 100 jerkbait (chartreuse shad). > Jerkbait (deep) gear: 7�2� medium-action Douglas Outdoors LRS spinning rod, Lew�s Custom Speed Spin 300 spinning reel, same line as shallow jerkbait, Strike King KVD Deep jerkbait. > Swimbait gear: 7�6� heavy-action Douglas Outdoors LRS casting rod, same reel as lipless, same line as lipless, 6/0 (3/16-oz. keel weight) Eagle Claw Lazer Sharp swimbait hook, 1/2-oz. (5/0 hook) VMC SBJ Swimbait jig head, 6.5� Producer Swimbaits Swiminator (TN Shad). The following anglers missed the cut and did not compete on day 3.